I’m back home after a packed last week of workshops, publisher parties, author meetings and seeing friends at Romance Writers of America’s 31st annual conference held this year at the Marriott Marquis Hotel in New York City. My daughter, Lisa, attended with me. It was her first national conference whereas I’ve been to almost too many to count over the past several decades. You’d think I would have heard it all before but I continue to learn and grow with each and every conference. Women’s Fiction in the Marketplace with agents Andrea Cirillo, Kristin Nelson, Meg Ruley and Ballantine executive editor Shauna Summers discussed today’s shifting marketplace. The afternoon wrapped up with authors discussing Surviving the Ups and Downs of Women’s Fiction: From Veteran to Newbie. Then it was on to the Literacy Autographing. Picked up my conference registration package and immediately put on my name badge which was needed to get into all the events. The “Readers for Life” Literacy autographing was held Tuesday from 5:30 – 7:30 p.m. and open to the public. About four hundred authors were autographing books for sale or brought by readers. This year the line extended from the 6th floor down the escalators to the main level and out the door, wrapping around the block! It was incredible! For the first time, I was thankful to wear my badge as it seemed to help get me in ahead of the many patient readers who waited for hours. Kudos to those authors who elected to remain well after the designated closing time to accommodate those readers. Heather Graham, Mary Burton and Cathy Maxwell were among the group of signing authors and it was so good to see them there. Beginning Wednesday there were three days of workshops featuring approximately 10 tracks each hour geared from a newbie to published author. In addition there were frequent Spotlights featuring various publishers. Also, there were special workshops just for published authors and not taped. Then, of course, there were the Publisher Book Signings where authors signed FREE books! Again, unbelievable! Lines started forming well before the signing time and I saw many people stagger out with boxes filled with autographed books. There are shipping facilities at the hotel fortunately as getting all the books from the conference home is a very real problem. Tess Gerritsen, whose books the popular TV series Rizzoli and Isles is based on, says, “People want to know secrets.” Her own secret–shared with her agent of 9 years only after she told Tess she’d need to be a doctor in order to sell a medical thriller: Tess is a physician! Steve Berry claims “selling a book is like running for president.” An attorney, he wrote for years before going to work. He completed 5 books and received 85 rejections before he sold a book. He didn’t quit and stayed until the world changed and the demand for his spy thrillers returned. The little nagging voice that said, “Write!” kept him going. There were many workshops either specifically about digital books or–at the least–questions posed to panelists about this subject. Most answers were non-committal in terms of what the future holds. Matthew Shear, SVP Publisher, St. Martin’s Press had the best e-book answer, “The most exciting moment in publishing history.” E-books represent 25% of his company’s sales and his recent signing of famed e-book author Amanda Hocking allows her the opportunity to expand her audience to the other 75% of his market base. New Adult: emerging market featuring characters ages 18 to 25 years old. Crossover: features characters ages 25 to 30 years old. Trading Cards: Rather than bookmarks, authors are using trading cards with book info on the front and the back featuring a book character–usually a hunky male! Nook Giveaway: At a PAN workshop Digitizing Your Backlist and More, Liz Scheier, Editorial Director for B&N.com, had a basket of delicious “write it pubit! profit” candy bars passed around to all attendees. One bar contained a token for a free Nook which she had with her and presented to a thrilled winner. Jon Fine from Amazon.com said that was a promotional idea he fully intended to steal! “Print books (sales) are rising, too, so people are reading more in different ways.” Jon Fine, Amazon. “Have an agent who will tell you what you need to hear, not what you want to hear. Once you’re published, you have not reached heaven. Writing is not like turning on a faucet. Writing doesn’t work that way. Horrible (writing) gets you to the good. I networked with authors, editors and agents and enjoyed catching up with them all. The Random House cocktail party in their executive boardroom was a highlight. Everyone was so hospitable and welcoming. I enjoyed talking with Suzanne Brockmann, who is one of my favorite authors and the author of over 50 romance and romantic suspense novels including the popular Troubleshooter series, and learned she just finished filming a movie she wrote herself with her husband and son. I also made it to a number of conference workshops that interested me and always learned something–or was reminded of something I already knew but hadn’t thought about it awhile. 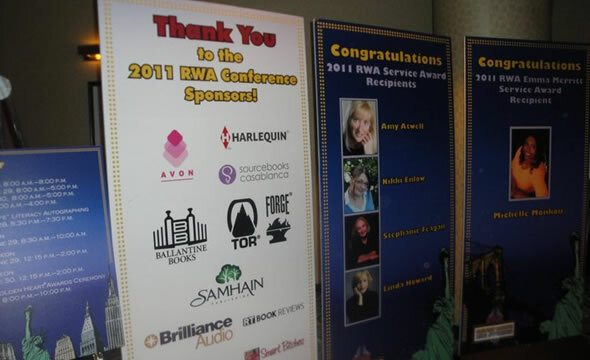 Will I go to yet another RWA national conference? You bet! Bottom line: the trip was worth my time and money in every possible way. Thanks Sally, it was almost as good as being there! You’re the best!!! Thanks for the summary, Sally. Since I couldn’t attend, I was eager to read your remarks. It sounds as though you had a great time and learned a lot! Thanks, Nancy! You usually supply me re-caps so especially delighted to return the favor!